It's back to college time! Summer is very quickly coming to an end and it is bittersweet. I may be going to Law School but I feel that the must-haves are very similar to those needed for undergrad. 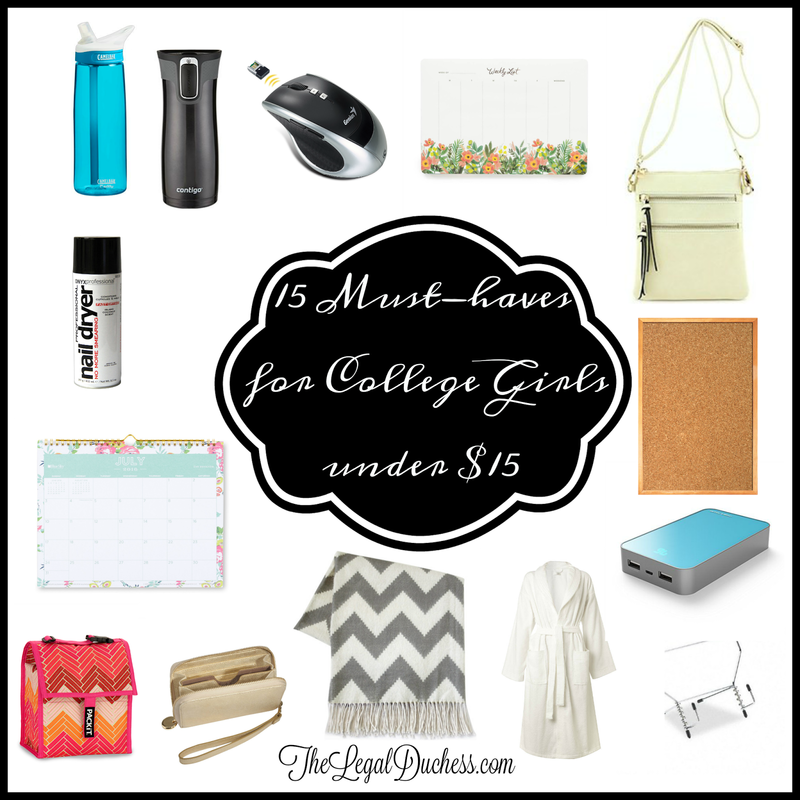 Below I have compiled a list (with links) to 15 items I found impossible to live without in undergrad and I am sure will also be fantastic in Law School. Best part? Each item is less than $15! I could never have survived college without coffee. That being said, for morning classes, I usually did not get out of bed early enough to drink a cup or two before those 8am's. A travel coffee mug solves that problem easily. I love this autoseal mug because it will not spill and it keeps drinks hot for a long time. I not only took my morning coffee but also hot chocolate and hot tea for late night study dates or cool walks to class. Law School will be no different and I will probably have a travel coffee mug practically glued to my hand. I HATE the mousepad on laptops. It just drives me nuts. Therefore, my wireless mouse is seriously my BFF and I couldn't live without it. I usually carry a giant "mom" purse or I just throw my wallet in my bookbag. However, there are times that a small-ish crossbody bag is a lifesaver. Whether it is for going out with friends, a date, a trip or sightseeing event of any kind and just so many instances where it just comes in super handy. I literally live by these things. I make one out every Monday morning and it just keeps all the assignments, work, meetings, dates and everything else so nicely and concisely organized. Long days on campus = no more battery. Keeping a portable battery pack charged and ready will save your phone and occasionality your sanity. I keep a small cork board above my desk for random papers and important things like business cards, etc. It is nice to have a small spot to collect all those random little papers that can easily get lost. Sooo I hate nasty looking nails and I also have no patience for waiting for my nails to dry. The answer to this predicament: nail polish drying spray! Paint your nails, spray, blow on them for a minute or two and off you go to class, the bar or a meeting with lovely nails and you didn't have to wait! I was a commuter all through college and I hated having to pay for lunch on campus; there's only so many ranch chicken wraps you can eat before you start to hate them. For any long days on campus, I packed a lunch that either didn't require refrigeration or I would stick it in the fridge in my academic advisor's office area (he was cool like that). I saved a ton of money and ate a lot healthier just by simply packing a lunch. Earlier I mentioned my habit of throwing my wallet in my bookbag before leaving for class. I got a cute little wristlet that holds my cash, cards, keys and cell phone. It was simple and handy to just move it from purse to bookbag or just carry it alone. For anyone else who is perpetually cold, having an extra (non-bedding) blanket is perfect. I would curl up in it while studying at my desk, watching movies, eating dinner, any of the above. I am always cold soooo I tend to have a lot of blankets. To reiterate the fact that I am always cold, I live in my bath robe. Not only does it keep me warm and toasty in the morning; it also is quite handy when living with 4 other girls or 3 boys (thankfully that was only one semester). Bath robe = necessary. Do yourself a favor and buy a book stand. It will make your life SO much easier when studying and save your neck. During college, you are constantly on the go and you usually take your laptop. Laptops are expensive so invest in a laptop sleeve and protect your expensive equipment that literally is your lifeblood in college. So you may have noticed a theme of organization and keeping everything straight? Wall calendar is another lifesaver in that department. I use my planner and weekly planning pad for everyday stuff but for the long term, a wall calendar is the way to go. t also has things like my then fiance/ now husband's work schedule so I know what he is up to as well as the long term things like finals. So there you go! 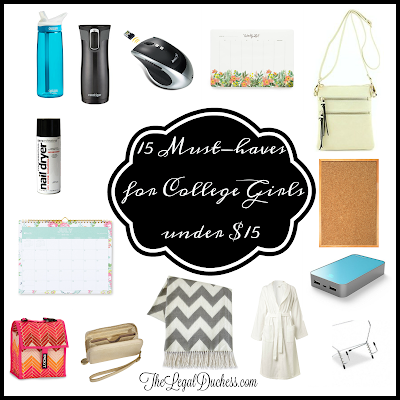 15 things every girls must have in college all coming in under $15 to fit within the college budget! Hope they help you as much as they help me! The Headhunters'' movie trailer above will provide you with a fantastic taste of the movie on jasonraymckenzie.com, but might tell you more than you wish to know.